ACTON - The streets that delineate this North Acton neighborhood bespeak its earlier history: Granite Road, Quarry Road, Ledge Rock Way. There was a time in the late 1800s when this was primarily an industrial zone, its granite used to manufacture sign markers, fence posts, and gravestones. Today, the same neighborhood may well be on the verge of again defining itself by its mother lode, but in a very different way. Several years ago, artists Yin Peet and Viktor Lois purchased 12.5 acres on Quarry Road, where they have not only built a home for themselves but also begun the creation of an artists colony of sorts, with studio and gallery spaces, a performance hall, and ornately cultivated grounds. On Aug. 1, they welcomed four sculptors to the first of what they hope will be an annual event. For the inaugural Granite Carving Symposium, the artists - one who traveled from Hungary, one a native of the Republic of Georgia, and two from New Hampshire - have been transforming enormous pieces of native stone into sculptures. Visitors to the Contemporary Arts International property, at 68 Quarry Road, have been able to watch their progress all month, and a grand opening for the display has been planned for Saturday, with the symposium wrapping up Sunday. Peet said she hopes that the public display will bring the community’s attention to the fast-growing arts center. When they planned the symposium, Peet and Lois solicited international participation. They particularly hoped to welcome artists from their own home countries, Taiwan for Peet and Hungary for Lois. But such are the vicissitudes of visas, funding, and bureaucracy that only one international artist was able to make the trip: Hungarian sculptor Laszlo Varkoly. The other participants are Batu Siharulidze, originally from Georgia and now a professor of sculpture at Boston University; John Weidman, director of the Andres Institute of Art in Brookline, N.H.; and Jenny Page, an adjunct instructor at the New Hampshire Institute of Art in Manchester. Set deep in the Acton woods, the site looks almost more like a construction zone than a design space. 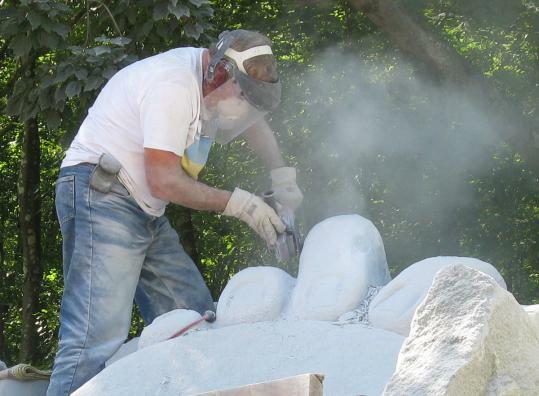 The sculptors wear safety goggles and use power tools; granite dust drifts down as they work. And yet upon closer inspection, what looks like a random pile of rocks yields unique shapes and designs. Meanwhile, cofounder Lois - who is Peet’s partner both in business and in life - is working on his own sculpture, as he carves Marilyn Monroe’s lips from a massive piece of stone next to the couple’s house. “The builder couldn’t excavate it because it weighs about 40 tons. So we decided we’d simply have to use it for an onsite piece,’’ Peet said. Though still in its early stages, the Contemporary Arts International complex already yields a multitude of pieces. On a grassy stretch of lawn stands “Ultimate Yin/Yang,’’ a 10-foot-tall, 20-ton granite and marble piece that Peet sculpted 12 years ago in Vermont. It is one of the only pieces that was moved to the site; the massive size and weight of rock sculptures mean that in general, pieces stay where they are made. Outside the studio space, along with the works-in-progress and enormous piles of granite for future artists to use, there is an ornately landscaped sculpture park that is used for private events. In all, said Peet, she has counted 51 works of art on the grounds of the compound. Peet wants her Acton neighbors to benefit from the arts center hidden in their midst. Obtaining the necessary permits to set up the operation was no small feat, she said, recalling that in 2006, she attended 56 meetings with town committees and officials. But now, she is proud of what she and her cohort of artists have created. The classes she teaches in sculpture in collaboration with the Massachusetts College of Art are open to community members, she is developing a sculpting program for teens, and she hopes that people of all ages will take her up on her invitation to visit during the granite-carving symposium. “It’s a very good opportunity to watch artists at work,’’ Peet said. “These artists are very experienced, and their style of working is confident and open. They are all very friendly, which is not always the case with artists while they are working. Send ideas for the Arts column to westarts@globe.com. GRANITE CARVING SYMPOSIUM At Contemporary Arts International, 68 Quarry Road, Acton. Exhibition of artists at work open from noon to 6 p.m. through Sunday, with a $5 donation for adults and $2 for children. Official unveiling is 11 a.m. Saturday.